Thailand held its first valid election since 2011 at the weekend. It was deeply flawed – and the Junta government of the last four years have stacked the odds basically to ensure that they form the new government – learning from the errors of the 2006 coupe makers who were wiped out in the 2007 election. The Economist had an early review of the process, results and implications. “We muct let good people rule and ensure that bad people have no power to cause trouble and turmoil,” stated King Maha Vajiralongkorn, quoting his late father, on the eve of Thailand’s election on March 24th. Yet turmoil there was. Late on polling day the Election Commission announced without explanation that it would not, after all, release preliminary results from the vote until the day after. It does not have to release final results for 60 days. But unofficial returns suggest the generals who seized power in a coup almost five years ago have stacked the deck enough to retain power. Around two-thirds of Thailand’s 51m voters turned out to cast ballots, a smaller share than in the previous election eight years ago. The decline will have disappointed those who depicted the poll as a battle to save democracy, including Thaksin Shinawatra, a former prime minister ousted in a prior coup, in 2006. Parties linked to Mr Thaksin have won every election since 2001. But his main vehicle, Pheu Thai, stumbled this time—admittedly on an uneven playing field. 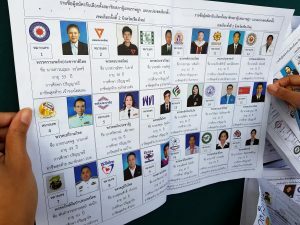 With more than nine in ten votes counted, Pheu Thai stood exactly tied, in terms of seats, with Palang Pracharat, a party founded last year to support the military regime, according to figures from Thai PBS, a state broadcaster. Leaders from both sides said they would wait to hear preliminary results from the Election Commission before commenting further. The generals will be delighted. “We are pleased with the results so far,” declared Uttama Savanayana, the leader of Palang Pracharat and a former minister for the junta. Years of manipulation paved the way for its strong performance. Members of the junta have been touring the country, touting the supposed virtues of their regime, but they did not let other politicians so much as meet with one another, much less campaign, until January. A second pro-Thaksin party was banned. A constitution passed in a stage-managed referendum in 2016 gave the generals the right to appoint the entire upper house of parliament. A new electoral system made life harder for big parties like Pheu Thai. For good measure, the regime has hounded critics, locked up activists and introduced harsh laws policing social media. The new constitution also says the prime minister does not have to be a member of parliament. That paves the way for Prayuth Chan-ocha, the coup leader, to remain prime minister. To do so he must be chosen by a joint sitting of the two houses of parliament. With the 250 votes of the senate in the bag, he needs only 126 of the 500 members of the lower house to pick him to secure a majority. Palang Pracharat will need to form an alliance to deliver those and more. But to get anything done, the generals need a majority in the lower house, which has the power to block legislation. The Democrats could join with Palang Pracharat more comfortably now that Mr Abhisit has gone. He declared he would not support Mr Prayuth’s bid to retain power. Other parties without too many hang-ups about democracy and fairness are likely to jump on the bandwagon. The sweeping powers the junta awarded itself in the wake of the coup will endure until a new cabinet is formed. That makes it easy to cajole politicians into their camp. Future Forward and Pheu Thai will remain implacably opposed, however. Whatever the wrangling over the next few weeks, the generals can claim a clumsy victory. But democracy is suffering a lasting defeat.